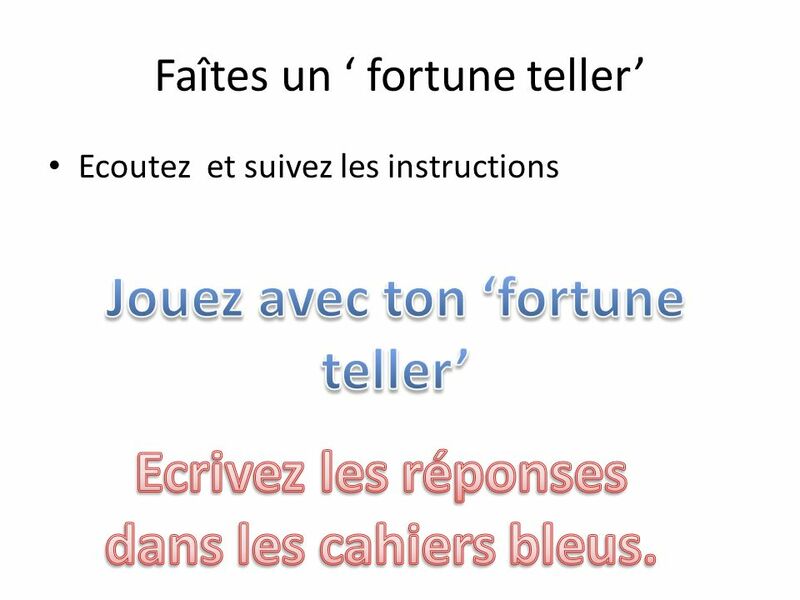 2 Pour commencer Tell your partner 3 facts about the present tense that you can remember from last lesson. 7 Devoirs! 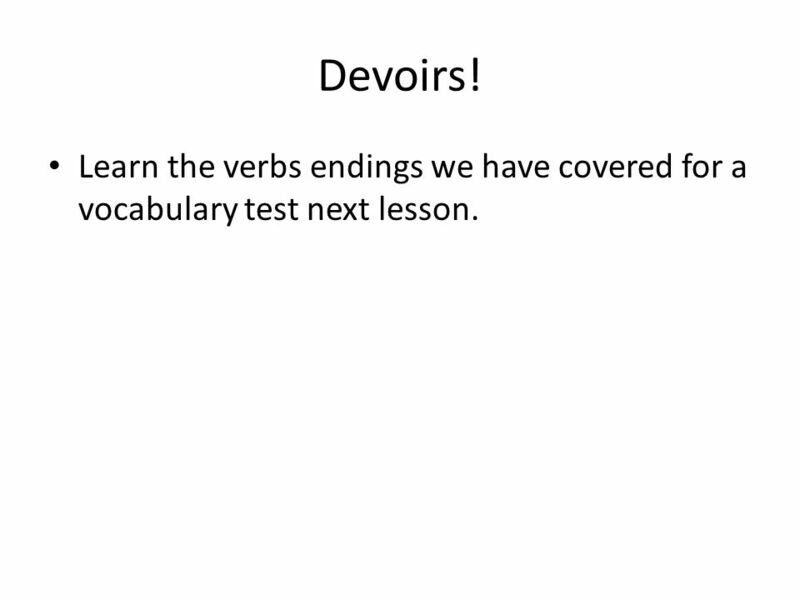 Learn the verbs endings we have covered for a vocabulary test next lesson. 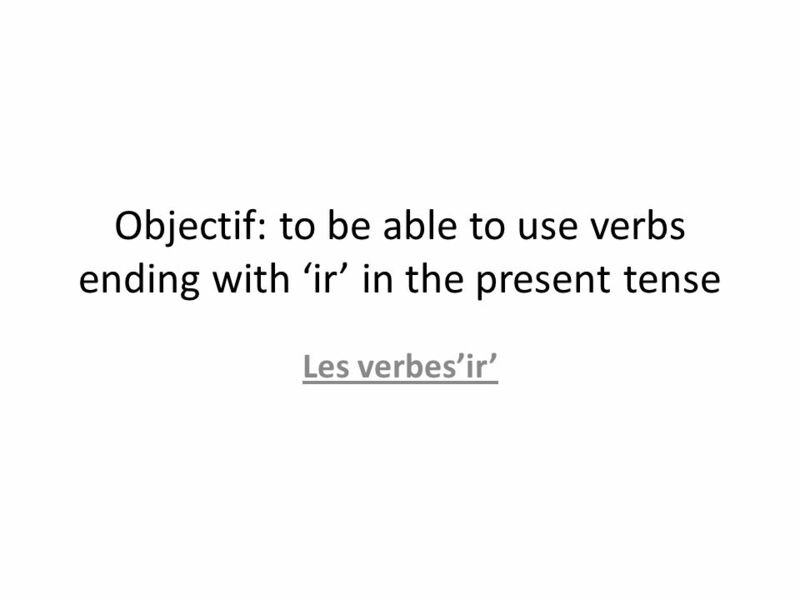 Download ppt "Objectif: to be able to use verbs ending with ir in the present tense Les verbesir." Page 11 finir. Step 1: Find the stem Remove the last two letters from the infinitive FINIR minus IR = FIN. FUTURE TENSE IRREGULAR AND REGULAR VERBS REGULAR VERBS ALWAYS KEEP THE WHOLE VERB, EXCEPT WHEN A VERB END IN E, IF IT DOES… REMOVE THE E.ALWAYS KEEP. Les pronoms accentués Emphasizing and clarifying whom you are talking about. Limpératif Commands Telling people what to do!. Régles »Only commands are in the tu, vous, and nous forms »When using the nous forms, it means Lets… »Only. 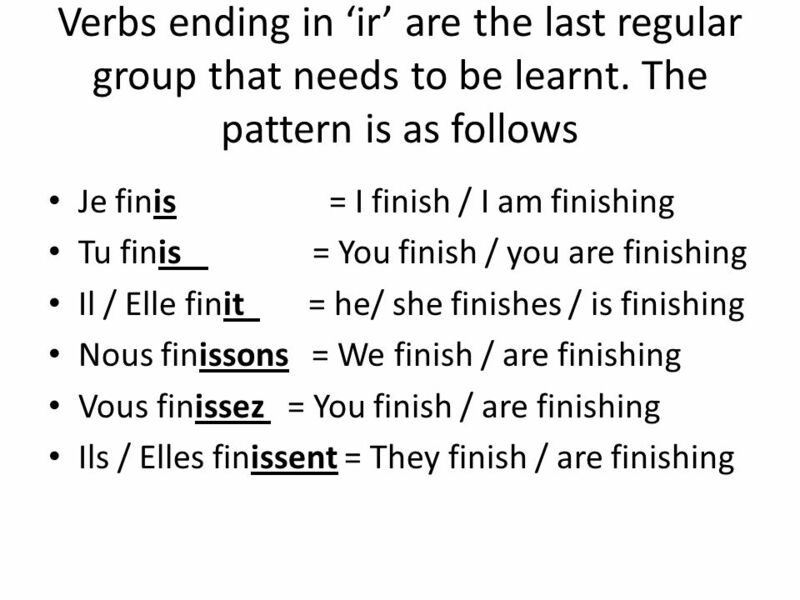 French 3/4 Group 1 Irregular Verbs Review. 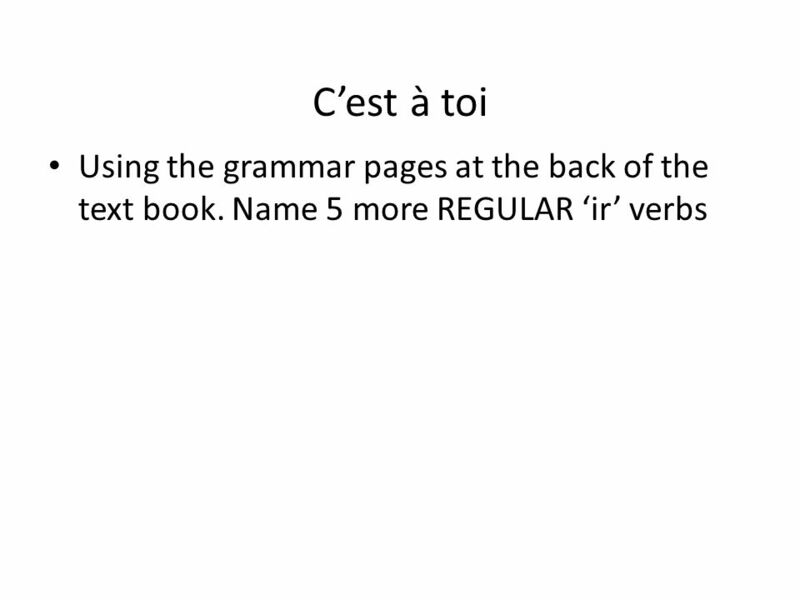 Change the following phrases into a questions by replacing the underlined phrase with an interrogative pronoun. The Present Tense Objectif: To be able to correctly use the present tense in French. Imperfect tense. Uses of the imperfect: Saying what you used to do Describing things in the past Saying what you were doing. Les Fourmis. Learning Goals By the end of this unit you will be able to: 1)Use être to tell about yourself & others 2)Use different adjectives (e.g. actif. 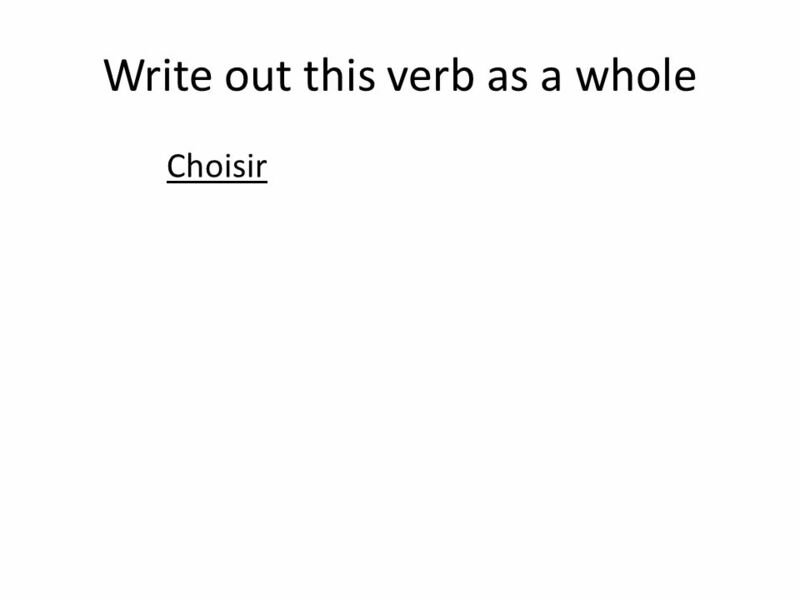 WALT: Talk about the past with leisure phrases, the verb “avoir” and time expressions. WILF: To be able to recognise when a phrase is in the past tense.